One of the capitals of the state of Rhode Island, U. S. A. Before the American Revolution, Newport excelled New York as a commercial center and port of entry; to-day, however, it is no longer of commercial importance, but has become one of the most fashionable watering-places in America. Newport was founded by Roger Williams, whose broad religious toleration soon attracted settlers of all denominations (see Rhode Island). The earliest authentic mention of Jews at Newport is in 1658, when fifteen Jewish families are said to have arrived from Holland, bringing with them the first three degrees of masonry. It has been suggested, however, that Jews from New Amsterdam (New York) and from Curaçao settled there even earlier, between 1655 and 1657. A congregation seems to have been organized in 1658 under the name "Jeshuat Israel." In 1684 the General Assembly of Rhode Island, in reply to a petition of the Jews, affirmed the right of the latter to settle in the colony, declaring that "they may expect as good protection here as any stranger being not of our nation residing among us in his Majesty's Colony ought to have, being obedient to his Majesty's laws." 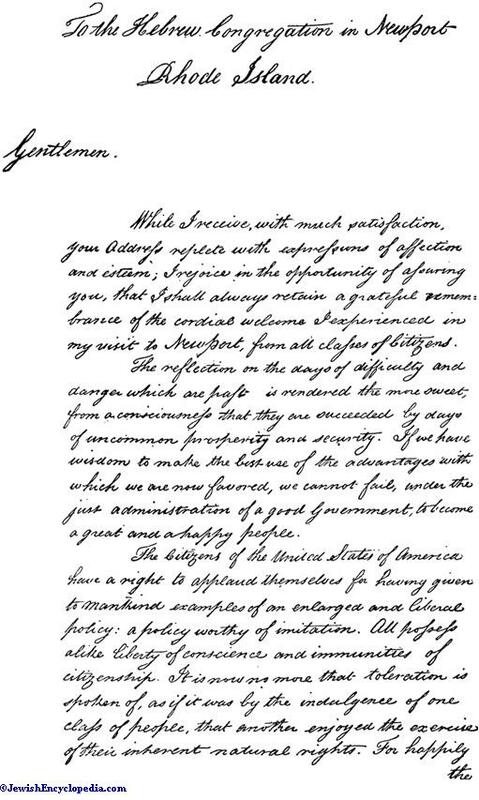 In view of this declaration it seems strange that Jews should have been refused naturalization in 1761 (see Rhode Island). Additional Jewish settlers arrived from the West Indies in 1694; but the great impulse to commercial activity which raised Newport to the zenith of its prosperity was given by a number of enterprising Portuguese Jews who settled there between 1740 and 1760. Most prominent among these were Jacob Rodrigues-Rivera, who arrived in 1745, and Aaron Lopez, in 1750. The former introduced into America the manufacture of sperm-oil, which soon became one of the leading industries; Newport had seventeen manufactories of oil and candles and enjoyed a practical monopoly of this trade down to the American Revolution. Aaron Lopez became the great merchant prince of New England. Of him Judge Daly says: "To him in a larger degree than to any one else was due the rapid commercial development which made Newport for a quarter of a century afterward the most formidable rival of New York." Ezra Stiles, the famous president of Yale College, states that "for honor and extent of commerce, he was probably surpassed by no merchant in America." Owing to Lopez, more than forty Jewish families went to Newport; and fourteen years after his arrival the town had 150 vessels engaged in the West-Indian trade alone; Lopez at the beginning of the Revolution owning thirty vessels engaged in the European and West-Indian trade and in whale-fisheries. This trade extended as far as Africa and the Falkland Islands. Among other prominent merchants of Newport in colonial times were members of the Levy, Seixas, Hart, and Pollock families. The Jewish population of the city received an important addition after the great earthquake at Lisbon (1755). Many secret Jews then left Portugal; one of the vessels, bound for Virginia, was driven into Narragansett Bay, and its Jewish passengers remained at Newport. Socially as well as commercially the Jews of Newport were highly respected. In 1761 the town possessed a Hebrew club. The congregation prospered; and in 1760 Isaac Touro came from Jamaica to become its minister, occupying the position till the outbreak of the Revolution. During all this time worship was held in private houses. In 1762, however, there being between 60 and 70 members, the erection of a synagogue was commenced; and the building was completed and dedicated in the following year; it is still standing. There is evidence that the Jewish population of Newport, even before the Revolution, contained considerable German and Polish elements. According to Tuckerman, the city numbered shortly before the outbreak of hostilities 1,175 Jews, while more than 300 worshipers attended the synagogue. The cemetery immortalized by Longfellow and Emma Lazarus was acquired by Mordecai Campannal and Moses Packeckoe in 1677, though it is possible that an earlier Jewish cemetery existed. Newport in colonial times attracted many Jewish rabbis from all parts of the world. Several of the names of these are to be found in Ezra Stiles's diary. He mentions meeting one from Palestine as early as 1759, two from Poland in 1772 and 1773 respectively (the latter of whom preached in Dutch), a Rabbi Bosquila from Smyrna, a Rabbi Cohen from Jerusalem, and Rabbi Raphael Ḥayyim Isaac Carregal from Hebron, who preached at Newport in Spanish in 1773 and became Stiles's intimate friend. The Revolution ended Newport's commercial prosperity. The city was taken by the British; and the Jews (who had espoused the patriot cause) lost the greater part of their property, particularly their ships, which were at once taken by the enemy. Immediately upon the British occupation the synagogue was closed, the rabbi going to Jamaica, and the majority of its foremost members, including Lopez, removing to Leicester, Mass., where they remained until 1782. 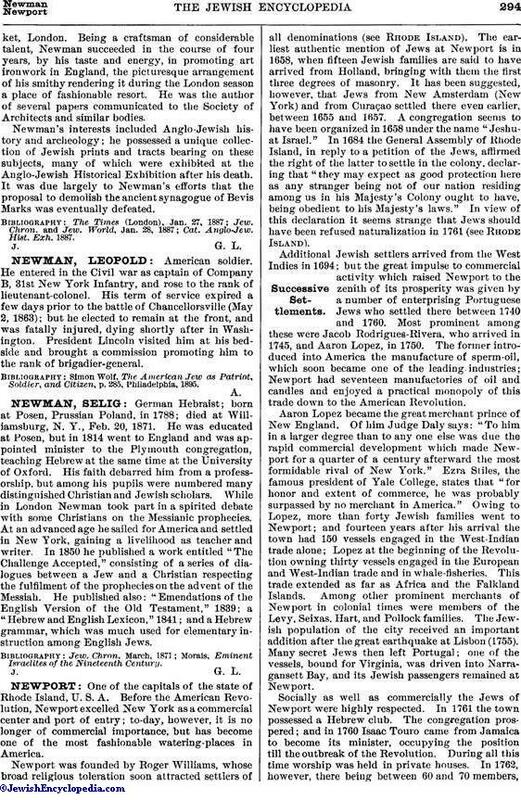 At Leicester these Newport Jews at once rose to the highest rank of the community, and a most appreciative account of their stay in that town is to be found in Emory Washburn's "History of Leicester." When the war was practically over, many of the Leicester colony set out for their former home. Aaron Lopez was drowned on the way, but was buried in the old cemetery. The General Assembly of the State of Rhode Island when it convened for the first time after the evacuation of Newport met in the historic synagogue (Sept., 1780). The edifice was at length reopened for worship, and services continued until about 1791. 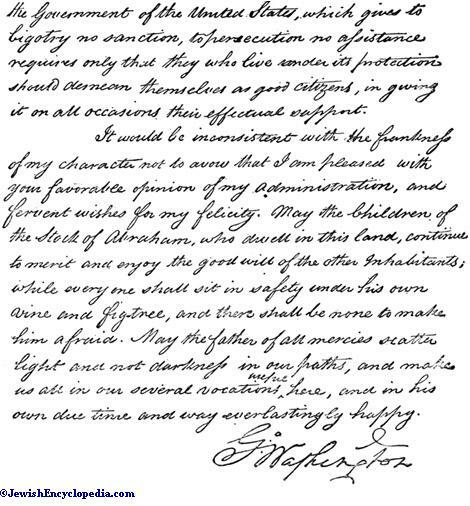 In 1790 the congregation formally addressed President Washington. The reply is still preserved and is reproduced here by courtesy of the owner, Mr. Frederick Phillips of New York. New York had now become the great commercial center; and the important Newport merchants left one by one for that city or for others which offered greater opportunities, namely, Philadelphia, Charleston, and Savannah. The number of Jews at Newport steadily decreased, until Moses Lopez, nephew of Aaron, was the only one remaining. He, too, ultimately left for New York, where he died in 1830. One of the last of this important colony was Moses Seixas, who for many years was cashier of the Bank of Rhode Island. The synagogue was closed soon after 1791, and was not reopened for about sixty years. It can not be said that during the interval Newport had a Jewish community. The city was, it is true, repeatedly visited by Jews; and sentiment caused the descendants of many of the original families to direct their remains to be interred in the old cemetery. Jewish tombstones show interments during the entire period down to 1855. Generally speaking, only such occasions brought Jews to Newport. Part of the Old Jewish Cemetery at Newport. The sons of the former minister did much for preserving Jewish places of interest. 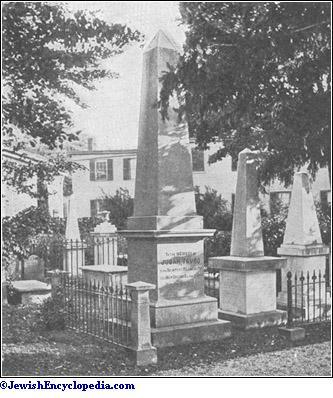 Abraham Touro (d. in Boston 1822) bequeathed a fund for perpetually keeping the synagogue in repair, and made provisions for the care of the burial-ground. In 1843 Judah Touro of New Orleans replaced the old cemetery wall by a massive one of stone, with an imposing granite gateway; and, at his own request, he himself was buried in the cemetery. The street on which the synagogue is situated is known as Touro street. The city possesses also a parkknown as "Touro Park." In 1850 the synagogue was reopened on a single occasion, when Dr. M. J. Raphall delivered a discourse there. Though the Touro fund provided for the support of the minister also, the synagogue remained closed until 1883, when the Rev. A. P. Mendes, on appointment by the Congregation Shearith Israel of New York, became its minister. He conducted its services until his death in 1891. Both synagogue and cemetery are now the property of the New York congregation, and the courts after litigation have sustained its title thereto. 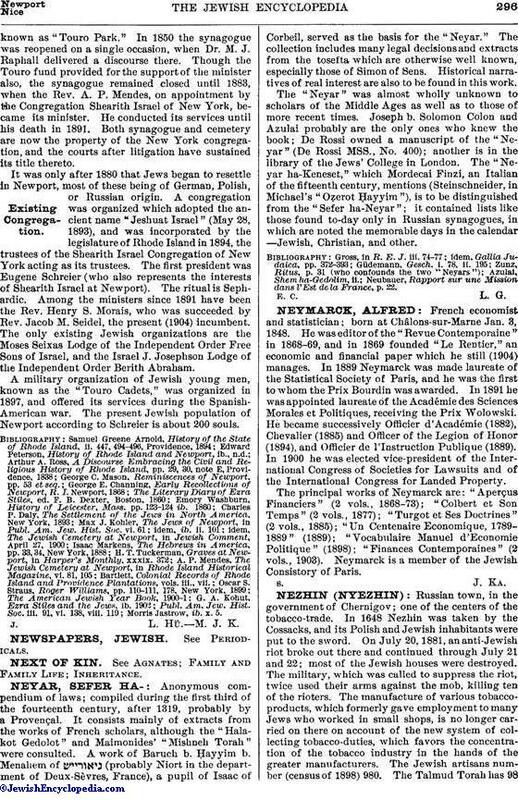 It was only after 1880 that Jews began to resettle in Newport, most of these being of German, Polish, or Russian origin. A congregation was organized which adopted the ancient name "Jeshuat Israel" (May 28, 1893), and was incorporated by the legislature of Rhode Island in 1894, the trustees of the Shearith Israel Congregation of New York acting as its trustees. The first president was Eugene Schreier (who also represents the interests of Shearith Israel at Newport). The ritual is Sephardic. Among the ministers since 1891 have been the Rev. Henry S. Morais, who was succeeded by Rev. Jacob M. Seidel, the present (1904) incumbent. The only existing Jewish organizations are the Moses Seixas Lodge of the Independent Order Free Sons of Israel, and the Israel J. Josephson Lodge of the Independent Order Berith Abraham. A military organization of Jewish young men, known as the "Touro Cadets," was organized in 1897, and offered its services during the Spanish-American war. 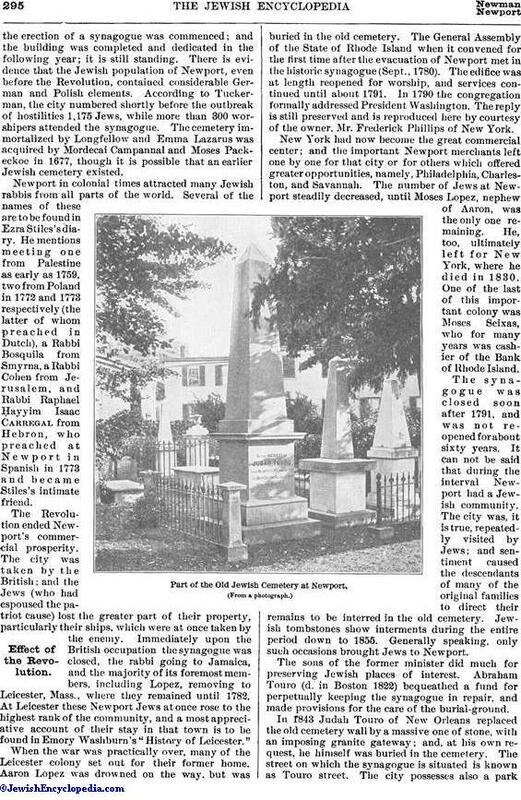 The present Jewish population of Newport according to Schreier is about 200 souls. Morris Jastrow, ib. x. 5. J. L. Hü. M. J. K.